Another week, another superhero movie. At least, that’s what it feels like these days. For some time now, this reviewer has regularly complained about a certain sameness within what has been dubbed the “Marvel Universe.” Admittedly, most are well made movies, but for a time, they have also felt like something coming off an assembly line. 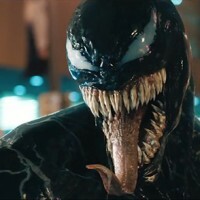 The new flick Venom marks an exception. It’s a very odd duck and one that might even be considered a black sheep in the Marvel cinematic family. For this reviewer, that’s nothing to be ashamed of. Outcasts are often interesting even if they come across as a little, well, irregular. It appears haphazard and imperfect, yet it also feels different from others of its ilk, doing away with a few of the expected genre tropes and opting for a peculiar, comedic tone. This won’t necessarily go over well with all comic book fans, but thanks to an almost surreal central relationship (involving a man and his parasite), this reviewer found himself more intrigued and amused than expected. The film begins with San Francisco journalist Eddie Brock (Tom Hardy) experiencing the worst day of his life. Over the span of a few hours, he’s fired by his employer for questioning the ethics of wealthy interview subject and Life Foundation president Carlton Drake (Riz Ahmed). His aggressive questioning not only ends his job, but his personal relationship with girlfriend Anne (Michelle Williams). Depressed, the down-on-his-luck protagonist is contacted by one of Drake’s scientists, Dora Skirth (Jenny Slate), who claims the poor are being victimized by the corporate head in horrific experiments involving alien symbiotic organisms. One of these parasites attaches itself to Brock, resulting in a violent creature called Venom. The film’s opening is a bit rushed. There’s a strange montage or two in setting up Brock’s life and relationship with his girlfriend. During the first act, the fast cuts even negatively affect the timing of a few verbal barbs. However, when the alien sludge finally meets new host Brock, the movie improves immensely. The lead character must deal with voices in his head promoting sinister impulses, as well as physical changes and an insatiable hunger. At times, it’s quite funny to see buddy movie tropes twisted through this very weird pairing. Hardy makes for a very skilled comedian, using both physical humor alongside arguing with a disembodied voice. The second act involves many entertaining segments featuring Brock wandering in a flop sweat and engaging in extremely bizarre behavior, to the shock of those around him. He’s equally horrified by his own actions. In particular, by the parasite’s disturbing desire to chow on human heads. It’s incredibly bizarre stuff, but the emphasis here is on dark comedy. And a strange thing happens as the movie progresses and the alien parasite opens up about itself... one actually starts to empathize with it. At first, director Reuben Fleischer (Zombieland, 30 Minutes or Free) may have seemed an odd choice to helm a superhero flick, but it makes sense after the comedic slant takes hold. As more gooey creatures break free from their confines and cause havoc, infants and small, fluffy pets become dangerous lifeforms; it’s clear that this movie is on goofballs and the filmmaker is more interested in the silly than typical action movie beats. As such, the film has a very unusual tone. Clearly, it wasn’t given the resources of bigger Marvel features and the climax also flies by a bit too quickly. Still, there’s plenty of enjoyable insanity populating the middle of the movie. Maybe I have a bizarre streak in me, but in the end, I appreciated its maniacal sense of humor. Venom is far afield from many superhero films out there and doesn’t take itself very seriously. While that may be off-putting to some, for this reviewer, the results were amusingly off-beat and intriguing.